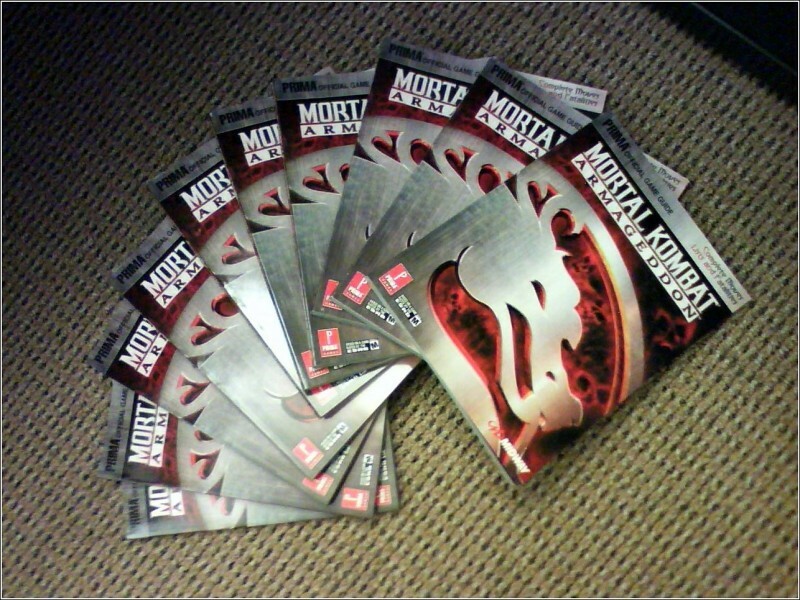 To celebrate our decade of covering the Mortal Kombat series, our good friends at Prima Games has provided us with ten (10) hard copies of the official Mortal Kombat: Armageddon strategy guide. With the news of Mortal Kombat: Armageddon making an appearance on the Xbox 360 backwards compatibility list, a renewed interest in the game has these guides extremely useful as Armageddon is truly the biggest game in the series. This 304 page tome is an amazing encyclopedia of information of every character's fighting style moves, combos, special moves and fatalities. It also features a Konquest Mode walkthrough, strategies for Motor Kombat, stage strategies, Kreate-a-Fighter tutorials and moves, fatalities and enders for Ultimate Mortal Kombat 3. Cool? Want to win one? Here's how. Simply leave a comment on this news post before Friday December 22nd, 2006, 11:59 PM CST (next week) and you will be automatically entered. Leaving multiple comments will NOT increase your chances to win a strategy guide. We will pick 10 random unique user replies the following week and we will ship out the guide to your verified address ASAP. Contest is open to all countries allowed to receive bound printed materials from the United States, which pretty much means anywhere. You know what I find terribly funny? I haven't bought Armageddon, I don't think to buy it, and I only want to rent it as a game that my friends and I -need- to play when all of mine are already boring. But, to get back to the point, I enjoy collecting strategy guides, and the cover of this one really catches my eye. cool contest. When was the last time TRMK had a contest? This will be a nice add to my game space. I would love to get one, the magazine is all for Armageddon! Only ten people eh? Contests are fun. This is a perfect way to celebrate the TRMK ten year anniversary. I'm not saying that winning a guide wouldn't be a good thing. Definitely a great crimmus present from The Realm. Cool contest! TRMK forever. Btw, wouldn't a new comparison between the xbox version and xbox360 version of MKA be a good idea? I would love to see the graphical differences. Sure I'll join this one and hopefully I get lucky. this is such a cool contest..
Well of course it is Mal, TRMK, ahem, Realm Media is way coolidge like that. Well unlike many people i actually like my MKA. You get 62 caracters. You get to design your own fighter. I made Khameleon with a new look but still with the moves, stances and weapons of the caracters that she is a combination of in MKT. Motor Kombat is a funny diversion although i think the best diversion game in MK is chess kombat. I ended up playing that more then the actual game itself. I only hope that Chess Kombat and Kreate a fighter return in the NEXT-gen MK game. i would be delighted to own one as it will come in handy for conquest. to ;have one would be awesome id come home and see the dragon eye on my bookcase...how cool it that? hope i get chosen. out of over the hundreds of fans here i would be thrilled to be one of the ten. im also happy there isn't any fake, sprite or wallpaper contest. (: btw to the mods and admins: if i get chosen, my adress as changed since i first joined so if i win jsut pm me for my new address. i hope i win one of those strategy guides!! I have the best intentions! I havn't posted in ages, and noone probably remembers me because of how little I posted, but what the hey, this is worth it. oh cool!!! i want this book trmk helps me a lot, i visit this site everyweek so...... that's cool there is this contest!!! thanks a lot!!!! I love my MK:Armageddon on XBOX 360... sign me up! I like random. I also hear "Havik was most impressed." Awesome. It'd be sweet to win this and add it to my MKDA guide I won from here awhile back And for all of you first time posters, welcome, sit a spell will ya? Whooo... and it will be send to Europe too hey?? NICE !! :D Great contest!! Sounds like a great contest. I'd love to have a guide so I can do those fatalities quicker. Lookin' Good Here! WOoW! I want one! Could easily come in handy as I just picked up MK:A now that its 360 compat. Alrighty, I guess this means I'm in. Ah, cool. Good lock to me. this contest is tight!!!!! i hope i win!!!! I so hope I win one of these guides. The guide would be quite helpful. A Mortal Kombat Armageddon Official Strategy Guide?? Excellent! Get Over Here!!!!!! *leaves his comment in hopes of teh strategy guide* Will this guide apply to the Wii version? Yes, I would like a strategy guide! Ah what the heck. Why not? Sign me up too.